Sterling Silver MOP Mosaic and Gemstone Bead Necklace, originally uploaded by dichroicdazzle. I don’t wear much jewellery at all but I am partial to pendants. I tend to wear a bone carving and occasionally swap it for a jade one that my niece gave me for Christmas. This is one that I would happily wear too. Sterling silver mother of pearl and gemstone necklace made from kyanite and rose quartz beads, murano glass beads, sterling silver beads rondell’s bead caps and twisted toggle clasp. This necklace features a stunning sterling silver shield pendant, designed by Linda Lambert, beautifully inlayed with pastel shades of mosaic mother of pearl (blue, mauve, ivory and pink). Check out dichroicdazzles’s Etsy shop. mosaic wall mural, shimotakaido, originally uploaded by hohbukuro. If you head over to Racine, Wisconsin this summer, you will notice a number of lighthouses popping up around the streets. 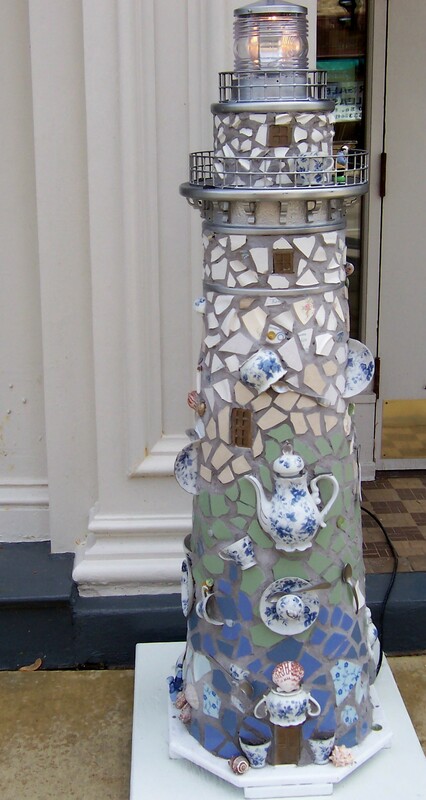 These are part of a public art event featuring 5 foot replicas of the Wind Point Lighthouse. Each artist involved in the project has created their own work of art from the original white replica. The lights even work! 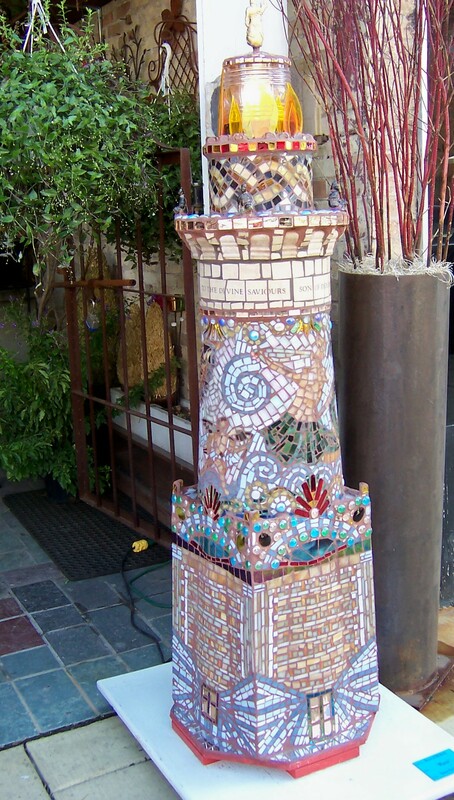 Here are two mosaicked lighthouses. One is a definite pique assiette style while the other makes use of vitreous glass tile and gems. Check out the original photos on flickr – these are best viewed large to see the fantastic detail. While you are there, make sure you have a look at the rest of the Lighten Up photoset. There are some great lighthouses there with themes ranging from King Kong and Stars Wars to the works of Frank Lloyd Wright.